#15 with a log train on a trestle in the Black Fox region north of Bartle. The Red River Lumber Company was established by a man named Thomas Barlow Walker. Red River was born in the vast pine forests of Minnesota, and for several years it operated a large sawmill in the town of Akeley, Minnesota. Mr. Walker could see the imminent end to the timber supply available to him in the area, and in the late 1800’s he sent his sons out west to look for a new home for the company. After much investigation the family chose the vast forests of northeastern California as the next area of operations for Red River. Red River set about purchasing timber lands in the area starting about 1894. At the maximum Red River’s California holdings totaled more than 1.25 million acres. Red River did not move into the California holdings until 1913, and when it did the company built a new sawmill in the new town of Westwood, CA, located many miles south of McCloud and towards the southern end of the Red River holdings in the area. The McCloud River companies reached the western fringe of Red River lands not far east of Bartle. For many years McCloud logging operations were limited to any further eastward expansion due to the Red River land ownership east of there. California-based electricity giant Pacific Gas & Electric entered the scene in the late 1910’s with an ambitious plan to build a series of dams and powerhouses to produce electricity along the Pit River, located about 23 miles south of Bartle. The McCloud River Railroad at Bartle was the closest railhead to the project area, and the utility was quickly in discussion with the railroad over the best way to get the needed supplies to the construction sites. The easiest way to get the materials in was to construct a new railroad from Bartle. The railroad was to be owned by the power company, but built and operated by the McCloud River Railroad under contract. Construction of the railroad started in early 1921, and by September of that year the line was opened to the first of the powerhouse sites. The actual project included construction of two large powerhouses, one large dam, power transmission lines, and many miles of pipe. The route as it was laid out left the railroad’s mainline just east of Bartle. The first 4.2 miles were over a lumber company spur leased to the railroad for the project. An additional 18.8 miles of new railroad were built from the end of the log spur to a point above the community of Peck’s Bridge, where the line split. One branch followed the Pit River upstream from there to the site of the Pit 1 powerhouse, while the other line went downstream past the site of the Pit 3 dam to the site of the Pit 3 powerhouse. Most of the line was built over Red River lands, and one of the clauses in the right-of-way agreements specified no common-carrier use of the new railroad. The Pit River project consisted of a number of dams and associated powerhouses, with Pit 1 being the farthest project upstream and the numbers increasing as one moved downstream. Initially the projects were assigned odd numbers only to allow for flexibility in adding more powerhouses later. Pit 1 project actually consisted of a small dam on the Fall River in the Fall River Valley, with the water piped underneath a small mountain range to the powerhouse, where the water was released into the Pit River. Pit 3 was located several miles downstream from Pit 1, and it consisted of a large dam holding back a sizeable reservoir (named Lake Britton). A large pipeline was constructed to move the water several additional miles downstream to the powerhouse. 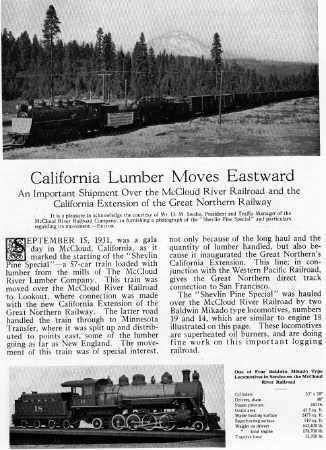 The McCloud River Railroad became interested in the possibilities of common-carrier service over the new line, and in 1921 the railroad entered negotiations with PG&E and the Red River to determine if arrangements could be made. Deals were struck, and the railroad commenced handling revenue freight over the line in addition to the contract operations. 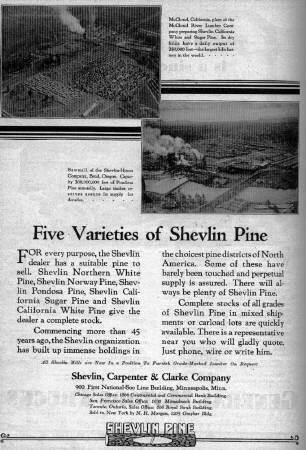 However, the new line did not generate enough new business to keep it in operation after the end of the PG&E operations, and the line was abandoned in 1934. Steam locomotive #25 leads a water car and a log train. The McCloud River Railroad purchased six of these large modern prairie type locomotives in the mid-1920's as part of a modernization program. Travis Berryman collection. As noted above, the eastward expansion of lumber company operations was limited by the ownerships of the Red River Lumber Company and the United States Forest Service. About 1919 the McCloud River Lumber Company purchased 25,000 acres of timberland from Red River, and a few years later purchased a huge Forest Service timber sale adjacent to the newly acquired lands. The lumber company immediately started construction of a rail line into the new area from the north. The new line branched off of the old mainline to McGavic at a point known as Slagger Camp, then circled into the new holdings from the north. The railroad made its first eastward expansion into the new holdings in 1923, when a branch of the common carrier railroad was built. The branch left the Bartle-McGavic mainline at a point known as Santa Claus Junction about four miles northeast of Bartle. The first short portion of the new line to a point known as Car A became part of the McCloud River Railroad, and the line east of there was lumber company trackage. The lumber company trackage reached a point referred to as Camp 2 (one of several such points known by that name) where a logging camp was established. This camp was re-named Pondosa camp by the lumber company about 1925. Extensive railroad yards and a repair shop were established at this location. The western terminus of the railroad received a new name in 1922. The memories of Justin Sisson were by now vague, and the name of the town was changed to Mt. Shasta City by popular vote. The lumber company had for many years used mobile logging camps that followed harvest operations. Camps consisted of portable buildings that remained in one place until that area was logged out, then the camp would be moved to the next area of operations. The lumber company would traditionally use multiple logging camps at once. In the late 1920’s the company decided to go to permanently located logging communities. By this point many of the loggers had families, and a community would be better suited to meeting the needs of the families than the portable camps. The site selected for the first camp was about eight miles south of Car A along the banks of Bear Creek. A new railroad line was built by the lumber company from Car A to the site of the new camp, and the railroad was granted trackage rights over the new line. The new camp was named Pondosa. The loggers moved in to the camp in late 1927. To eliminate the name duplication, the Old Pondosa camp was re-named Hambone. Pondosa was closer to Burney and the Fall River Valley than Bartle, and before long the interchange of freight bound to and from these regions was being handled through Pondosa. From the Glen Comstock collection. The railroad had offered passenger service over the line between Mt. Shasta City and Bartle essentially since the commencement of service. The first real challenge to the railroad’s grasp on passenger service came from an auto stage line that started offering service between McCloud and Mt. Shasta in 1916. The railroad responded in 1927 by canceling passenger service west of McCloud in favor of it’s own bus line (which immediately brought a flurry of lawsuits and complaints of illegal competition from the bus line owner). The railroad bought the bus line out in 1928 and entered the passenger business by highway under a subsidiary, the McCloud Transportation Company. Passenger trains after that date west of McCloud were run only for special occasions or when the busses could not run. Passenger traffic east of McCloud continued to be offered for several years afterwards, but by the 1940s it was essentially dead as well. The Great Northern Railroad completed its transcontinental line from the Twin Cities west to the shores of Puget Sound in the latter part of the 1800s. The Hill family that built the road long dreamed of extending their line south to California, and through the early 1900s they attempted to do just that, but found their was blocked at every turn by Edward Henry Harriman, who at that time was in control of both the Southern Pacific and Union Pacific Railroads and had no intention of letting the Great Northern into California. The Hill family tried coming down through western Oregon, but managed to push a GN subsidiary only as far south as Eugene before they found their way blocked. 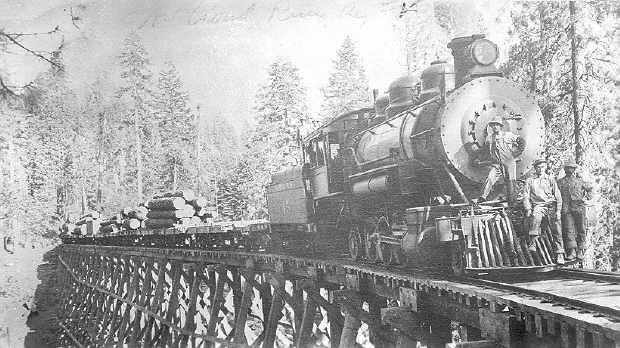 In the early 1900s the family tried a second route east of the Cascades, and the result was one of the last major railroad wars in the western United States as a Hill road and a Harriman road fought each other for passage through the Deschutes River Canyon into central Oregon. Eventually an agreement was reached that allowed both roads access over the same track, and the community of Bend, OR was reached in 1912. By 1924, a railroad financier named Arthur Curtiss James held seats on the boards of both the Great Northern and Western Pacific railroads. James envisioned a joint GN-WP line that could, in combination with the Atchison, Topeka & Santa Fe, provide competition to Southern Pacific's monopoly on north-south rail traffic along the Pacific coast. GN resumed building south from Bend in 1926 and reached Klamath Falls in 1927, partially on trackage rights over SP's main line between Chemult, Oregon, and Klamath Falls. In the middle of all this the McCloud River Lumber Company purchased from Red River the harvesting rights to the White Horse tract, 80,000 acres of pine primarily in southwestern Modoc county. GN either had some hand in orchestrating the sale or otherwise immediately recognized the potential of establishing a connection with the McCloud River Railroad, as within a month the GN inked two deals with the lumber company, the first to lease to it rails, switches, and other track materials to be used in the mainline logging railroad from the eastern end of the McCloud River Railroad into the sale, and the second a ten-year option to buy the line from the lumber company. 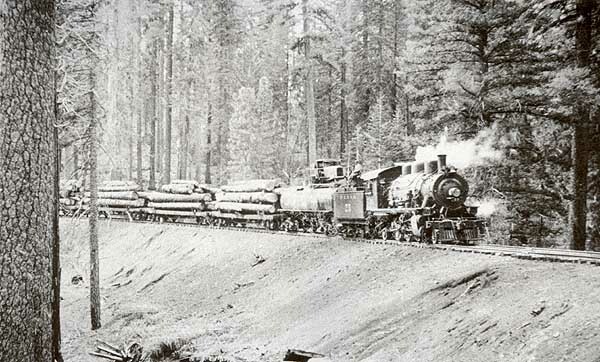 The McCloud River Railroad purchased the lumber company's line from Car A to Hambone, and the lumber company immediately used those rails to build a logging railroad from Hambone through some lands the company had already logged over and then a recent lava field into the White Horse tract, where the lumber company established another semi-permanent logging camp at White Horse. Like Pondosa, White Horse would serve as the base of operations for loggers and railroaders working in the woods. In February 1929 the Great Northern and Western Pacific filed a joint application to construct a railroad between Klamath Falls, Oregon, and Keddie, California, together with a 33-mile branch running from Lookout Junction west to Hambone. The Interstate Commerce Commission approved the line in June 1930, and work started form both ends immediately thereafter. A second rail lease allowed the McCloud River Lumber Company to extend its logging railroad mainline from White Horse to Lookout Junction. The GN and WP met at Nubieber, California, on 10 November 1931; on that same date the two roads excercised their option to purchase the lumber company mainline from Lookout Junction to Hambone. WP eventually sold thier half interest in the branch to the GN in exchange for trackage rights on the Bieber-Lookout-Hambone line, which the company never used. The Depression did take its toll on both McCloud companies, but both were able to survive. There were periodic layoffs and slowdowns in all operations, including the temporary closure of the Pondosa camp for a couple years, but those who were temporarily un-employed were given free room and board in McCloud until they could be put back to work again. Pondosa did gain additional importance to the railroad when Harry Horr moved his sawmill from Cayton Valley to there following the closure of the Pit River Railroad. Most timber companies that survived the Depression could see that the economic storms would not continue forever, and many of these companies did everything they could to retain workers until better times arrived.